If you are looking to relocate in the Central Valley, close to schools, supermarkets, shopping malls, close to everything, these two spots are just perfect! These two towns are located 10 minutes away from each other and only 20 minutes away from central San Jose. This strategic location allows people to move easily to different parts of the country. Within a one hour drive, you will be in the best beaches of the Central Pacific coast and close to the best touristic spots of Costa Rica. Real estate in Escazu and Santa Ana is very varied. If you are looking for a townhouse, a condo, an apartment, a big property with a small house, or a giant estate, you’ll find it here. It is really diverse and in every corner, you’ll find a high-class living style. Near each suburb, you will find different commercial centers which offer fine dining, top choice supermarkets, stores, and more. In these two towns, you’ll find everything you are looking for in a short distance! Santa Ana and Escazu are connected by the 27th highway or by the old road that passes through the picturesque center of each town. Something magnificent about these two towns is how the modern architecture, the beautiful communities, the first world amenities, mix with the rural side of the town and the astonishing mountains. Both centers include their typical churches with plazas and soccer fields at the side. It is very common to see food farmers markets during the weekends with fresh fruit, tortillas, cheese, bread, and more homemade goods. Escazu is home to one of the main shopping malls in the country, Multiplaza. Here you will find plenty of stores, food courts, top restaurants, supermarkets and more. You will also find Avenida Escazu, one of the most modern commercial centers that keep growing each year. In this place, you will find fancy restaurants such as P.F. Changs and some healthy ones such as Bulali, as well as top cinema studios, designers clothes, Texas Tech University, and much more entertainment. Near Escazu, you will also find plenty of private and public schools as well as hospitals. Santa Ana is one of the best choices for owners since it’s proximity to some of the best private schools. The access to the 27 highway is so easy that you can access it from every part of the town to get to San Jose or to the Pacific Coast. There are also plenty of places for fine international dining, one of the newest pet-friendly shopping centers Terrazas Lindora with VIP Cinemas and a spacious food court. Both are surrounded by beautiful mountains and have a warm weather during the dry season and some chilly days during the green season. On the hilltops, you’ll be able to appreciate the magnificent windmills. Since it’s location in the central valley, at nights, you’ll be able to see all the beautiful lights sparkling on the mountains. Living here you will be able to enjoy all of the modern amenities offered, immediate access to health care as well as the proximity to some of the best international schools in the country. Costa Rica is known worldwide as the quintessential tropical paradise for both mountain and beach lovers alike, and with so much nature to offer, it is no surprise its number one industry is now ecotourism, holding the #1 spot for the top visited countries in Central America for this exact same reason. Many of these visitors come to Costa Rica because of its beautiful coasts, which extend for 1,228 Km, with shorelines on both the Pacific Ocean and the Caribbean Sea, and the most common activity on these areas, especially in the Pacific, is definitively surfing. The northern Pacific area of Costa Rica, and its tropical dry forest, with its sunny days most of the year, even during winter; you will get the perfect description for paradise, commonly known as the Gold Coast of Costa Rica. Guanacaste has approximately 180 Km of shoreline completely open to the Pacific ocean, and given its volcanic rock formation, you will find some of the best surf breaks nestled in its magnificent beaches, from Ollie’s Point and Witch’s Rock up north, to Playa Samara in the southwest. Right in the middle of Guanacaste’s shoreline, you will find a collection of great surf spots among the most touristic towns, perfect for seasoned surfers and beginners alike, and easily accessible through paved roads. Among these fantastic surf spots, you will find a nice point break in the north end of Flamingo Beach, with white sand and turquoise waters that create hollow waves over a coral reef break, and a beach break in Brasilito Beach, with a sandy bottom and waves that break from the left; followed by the most known spots in the area: Playa Grande, Playa Tamarindo, Playa Langosta and Playa Avellanas. 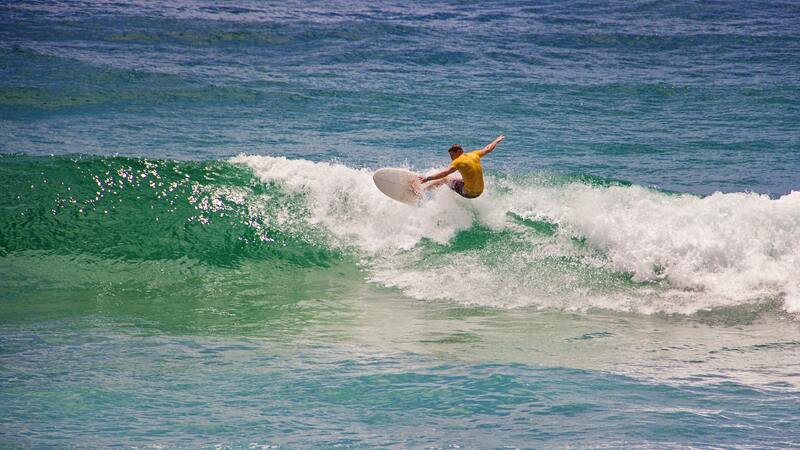 At Playa Grande, you will find a beach break with long rides and barrels, breaking at both right and left. Playa Tamarindo offers 4 different surf spots: El Estero, a river mouth break over a sandy bottom, Pico Pequeño, that even though offers small waves is not recommended for beginners due to its rocky bottom, Capitan Suizo, a small beach break, and Isla Capitan, an exposed reef break recommended for experienced surfers. Playa Langosta offers a river mouth break over a sandy bottom, with strong and fast waves posing a fun challenge for advanced surfers. Playa Avellanas, with its 5 different points, is one of the most visited surf destinations in the area, this because its breaks are suitable for both beginners and advanced surfers. La Purruja, on the southern end of the beach, is a right-hand reef break best surfed during the rainy season, from May to November. El Parqueo, a nice beach break that offers a good spot for learners, as its waves break in both directions, is best surfed during the dry season. El Palo, a second beach break, offers nice barrels and perfect waves at high tide. El Estero, a river mouth break with right and left breaks over a rock and sand bottom, and finally, Little Hawaii, a right-hand break over a rocky bottom that can reach heights of up to 6m, perfect for advanced surfers and a favorite among locals. Further south you will find Playa Negra, an internationally-known spot that breaks over a reef, with fast and hollow waves offering a fun challenge for seasoned surfers; whom can also enjoy Playa Junquillal’s beach breaks, which go in both directions, and a left-handed reef break, producing tall and hollow waves. Last but not least is Playa Marbella, with its two surf spots: Playa Coco and Playa Frijolar. Coco is a beach break with large and hollow barreling waves, breaking both left and right, and most suited for experienced surfers, especially during large swells. Frijolar is the perfect spot for learners, given its left-hand point break over a sandy bottom, which produces hollow waves and barreled sections when the sand dunes are in the correct spots. No matter how advanced your surfing is, and even if you have never even touched a surfboard, once you see any of these beautiful beaches and their amazing surf spots, you will instantly feel to urge to ride a wave, and who knows, maybe, as it has happened to many, you decide to stay and try them all, which we hugely recommend! Take advantage of the popularity of these surf spots and their ample real estate market, and find your home away from home in any of these areas with our help. Why visit Costa Rica during the rainy season? Costa Rica is a tropical country that counts with only 2 seasons: Dry or summer, and rainy often known as the green season or winter. Summer extends from December thru April, where the driest months tend to be February and March. On the other hand, the green season goes from April till November. Nevertheless, like most tropical countries, the climate is mostly unpredictable. During the first months of the rainy season one can experience a small amount of water, sometimes it doesn’t even rain. During the mornings the days are sunny and warm, around 4 to 5 pm is when the rain starts to fall. Nevertheless, during the months of October and November precipitation is more constant and strong. Sometimes you’ll wake up at 6 am and rain will continue until the next morning. Other times, you’ll wake up with a rainy day but around 4 pm you’ll have a nice afternoon. Nevertheless, the rainy season never stops tourists or locals to discover our beautiful country! There are many outdoor activities that can be done during these months. Rafting is one of the top adventure activities to perform during this season. Most of the rivers tend to grow and make this extreme sport even more fun. There are different levels you can choose from, but during winter the rain will assure you a bumpy ride! As it’s stated on the name, during these months we’ll have the greenest and beautiful trees and mountains that are now recovering their colors after the dry season. Flowers flourish, flora and fauna meet outside and brighten all of the colors of nature. 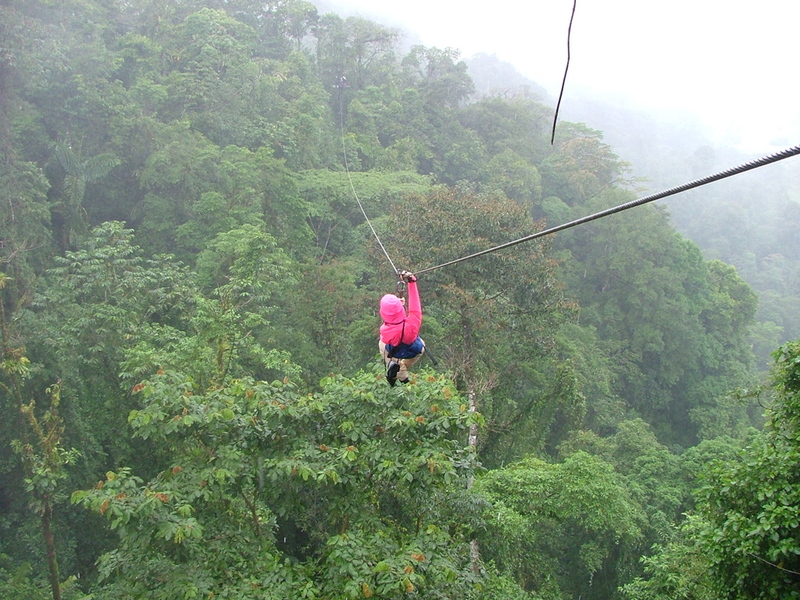 Hiking and canopying through the tropical rainforest is another great option for the green season. You’ll be able to see all types of flowers, butterflies of different colors, bright fungi, monkeys, sloths, macaws, snakes, and more animal in their natural habitat enjoying what nature has to offer. During the winter, we also have oceanic spectacles like whale watching and the massive arrival of sea turtles. On the months of August, September, and October you can book a tour to watch these gigantic mammals swimming through our Pacific Ocean. They come to Costa Rica to mate or give birth, so we have plenty of humpback whales in our oceans, sometimes they can even be appreciated from the shore. Turtles come to lay their eggs while simultaneously some of the eggs left the season before hatch. It is a beautiful encounter of big turtles making their way through the sand and leaving around 100 eggs, while right next to them some small turtles begin to crawl out of the sand and make their way to the ocean. One of the best parts is that prices tend to be lower during winter and we have tons of offers for nationals and tourists! So it’s a cheap way to visit our country. During the rainy season, Costa Rica keeps surprising us. Nature here is just beautiful and breathtaking. Even though the rainy season goes from May thru mid-November, just like the dry season, these periods may extend or diminish. Nevertheless, rain begins until 3 pm, having plenty of time during the morning to enjoy the light breeze and sunshine. This is the best time to visit the rainforest and have a full experience of it. Watch animals in their natural state and enjoy Costa Rica with a different view!